Safe to say it’s summer yet? When shopping at the Kerrytown Farmer’s Market last week, I can finally believe it. Produce stands are in full swing, with berries, squash, mushrooms, greens and tomatoes begging to be put to good use. Yesterday I purchased a 7-ounce ball of Italian-imported buffalo mozzarella from Trader Joe’s. The classic pairing of tomatoes — hot from a local vine — paired with creamy mozzarella is just what I’m craving. Of course you could keep the dish entirely local by pairing the tomatoes and bread with mozzarella freshly made from Zingerman’s or The Boulevard Market in Tecumseh. Both sell there wares at the Ann Arbor Farmers Market in Kerrytown, and Produce Station carries local cheeses as well. Usually these are my choices for pairing with tomatoes. 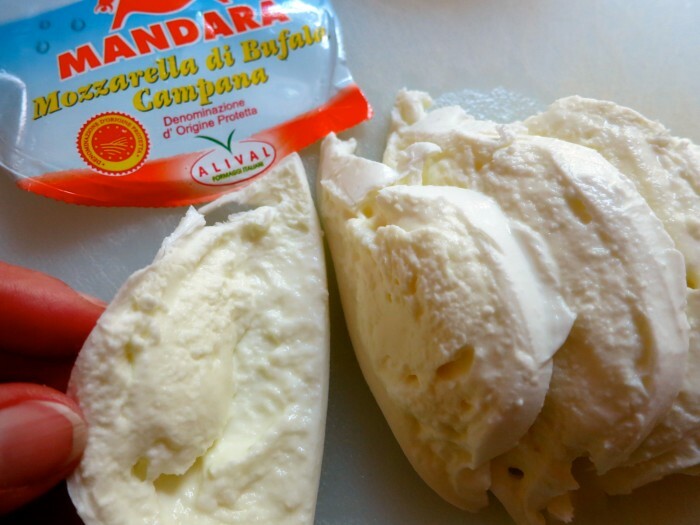 Last fall I spent a couple of weeks visiting a friend in Lucca, Italy, and was spoiled with the buffalo mozzarella readily available on every street corner. It’s creamy and has a unique, piquant tang that buffalo milk provides; what I’d purchased from TJ’s was quite good. Here’s another recipe for a classic tomato-mozzarella (Caprese) platter with pesto oil. Rub cut side of garlic over both sides of bread (reserve garlic cloves). Brush both sides with 2 tablespoons of the olive oil. Toast bread in oven or grill over medium heat until just crisp. Finely chop garlic and whisk into vinegar and remaining 3 tablespoons olive oil; season to taste with kosher salt and freshly ground pepper. Slice tomatoes and lightly season with kosher salt and freshly ground pepper. Slice mozzarella. Make a chiffonade of basil by stacking the leaves together, rolling them into a cylinder, then (with a very sharp knife) slicing the cylinder into threads. 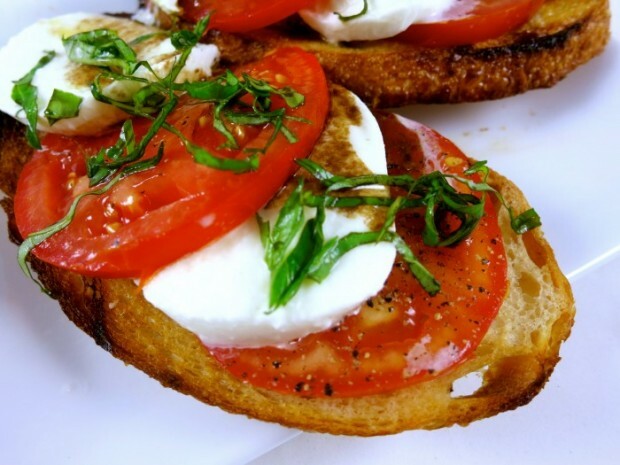 On plates or a serving dish, arrange tomatoes and mozzarella on toasted bread, drizzle with vinaigrette, top with chiffonade and serve. *For this loaded bruschetta, I prefer a thinner sliced bread, so the final bite is not overwhelming. 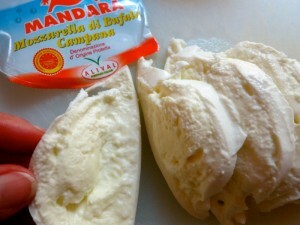 Fresh mozzarella from White Lotus Farm is yet another local delicious cheese .